The Colorado River study area is approximately 884 square miles (2,290 square kilometers) and includes the Needles, Palo Verde Mesa, Palo Verde Valley, and Yuma groundwater basins (California Department of Water Resources, 2003). The Colorado River study area has an arid climate and is part of the Sonoran Desert. Average annual rainfall is about 3 inches (8 centimeters). Land use in the study area is approximately 47 percent (%) natural (mostly shrubland), 47% agricultural, and 6% urban. The primary crops are pasture and hay. The largest urban area is the city of Blythe (2010 population of 21,000). Groundwater in these basins is used for public and domestic water supply and for irrigation. The main water-bearing units are gravel, sand, silt, and clay deposited by the Colorado River or derived from surrounding mountains. 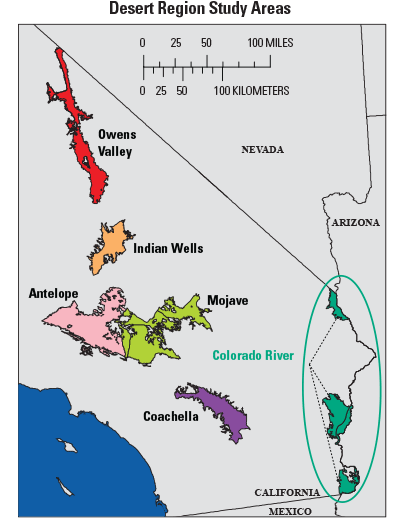 The primary aquifers in the Colorado River study area are defined as those parts of the aquifers corresponding to the perforated intervals of wells listed in the California Department of Public Health database. Public-supply wells in the Colorado River basins are completed to depths between 230 and 460 feet (70 to 140 meters), consist of solid casing from the land surface to a depth of 130 of 390 feet (39 to 119 meters), and are screened or perforated below the solid casing. The main source of recharge to the groundwater systems in the Needles, Palo Verde Mesa, and Palo Verde Valley basins is the Colorado River; in the Yuma basin, the main source of recharge is from subsurface flow from the groundwater basins to the west. Groundwater discharge is primarily to pumping wells, evapotranspiration, and, locally, to the Colorado River. GAMA’s Priority Basin Project evaluates the quality of untreated groundwater. However, for context, benchmarks established for drinking-water quality are used for comparison. 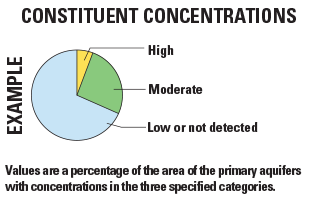 Benchmarks and definitions of high, moderate, and low concentrations are discussed in the inset box on page 3. The USGS sampled 20 wells for this assessment; data from the California Department of Public Health database were used to supplement USGS data. Many inorganic constituents occur naturally in groundwater. The concentrations of the inorganic constituents can be affected by natural processes as well as by human activities. In the Colorado River study area, one or more inorganic constituents were present at high concentrations in 45% of the primary aquifers and at moderate concentrations in 35%. 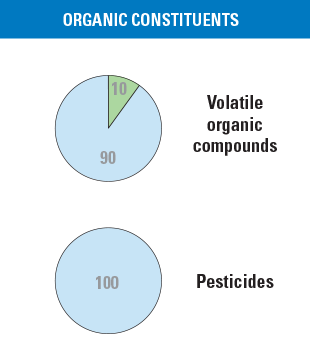 Organic constituents are present in products used in the home, business, industry, and agriculture. 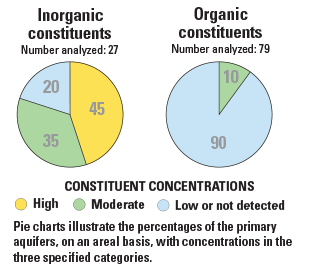 Organic constituents can enter the groundwater system through normal usage, spills, or improper disposal. In the Colorado River study area, organic constituents were present at moderate concentrations in 10% of the primary aquifers. Trace elements are naturally present in the minerals in rocks and soils, and in the water that comes into contact with those materials. In the Colorado River study area, trace elements with human-health benchmarks were present at high concentrations in 40% of the primary aquifers, on an areal basis, and at moderate concentrations in 30%. Of the 17 trace elements with human-health benchmarks analyzed in this study, 5 were detected at high concentrations: arsenic, boron, fluoride, molybdenum, and strontium. Chromium was detected at moderate concentrations. Radioactivity is the release of energy or energetic particles during structural changes in the nucleus of an atom. 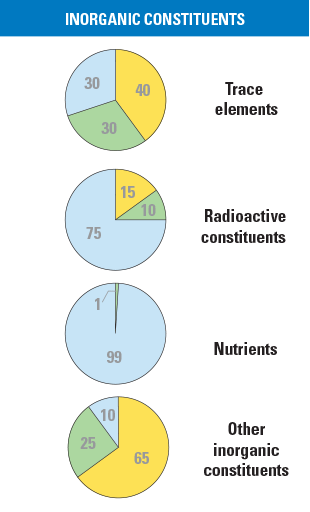 Most of the radioactivity in groundwater comes from decay of naturally occurring isotopes of uranium and thorium that are present in minerals in the aquifer. In the Colorado River study area, radioactive constituents were detected at concentrations above benchmarks in 15% of the primary aquifers, and at moderate concentrations in 10%. Six radioactive constituents were analyzed; of these, uranium and gross alpha radioactivity were detected at concentrations above benchmarks. Radon was detected at values within one-half of the proposed upper benchmark. Nutrients, such as nitrate and nitrite, are naturally present at low concentrations in groundwater. High and moderate concentrations generally occur as a result of human activities, such as fertilizer application, livestock waste, or septic-system seepage. Of the three nutrients with health-based benchmarks analyzed, one, nitrate, was detected at moderate concentrations. Other inorganic constituents, such as total dissolved solids and manganese, affect the aesthetic properties of water, such as taste, color, or odor. In the Colorado River study area, these constituents were present at high concentrations in 65% of the primary aquifers, and at moderate concentrations in 25%. Of the seven constituents with non-health-based benchmarks that were analyzed, five were detected at concentrations above benchmarks: chloride, iron, manganese, sulfate, and total dissolved solids. 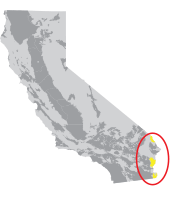 Perchlorate is an inorganic constituent that has been regulated in California drinking water since 2007. It is an ingredient in rocket fuel, fireworks, safety flares, may be present in some fertilizers, and also occurs naturally at low concentrations in groundwater. In the Colorado River study area, perchlorate was found at moderate concentrations in 35% of the primary aquifers. VOCs are present in many household, commercial, industrial, and agricultural products and are characterized by their tendency to volatilize into the air. Of 56 VOCs with health-based benchmarks analyzed in the Colorado River study area, the VOC 1,2-dichloropropane, a fumigant, was detected at moderate concentrations in 10% of the primary aquifers. All other VOCs were detected at low concentrations, or were not detected. Pesticides are used on lawns, in gardens, around buildings, along roads, and in agriculture to help control unwanted vegetation (weeds), insects, fungi, and other pests. In the Colorado River study area, pesticides were not detected or were only detected at low concentrations. Of the 20 pesticides with health-based benchmarks that were analyzed, none were detected at high or moderate concentrations in the Colorado River primary aquifers. Trace elements were present at high concentrations in all of the Desert Region primary aquifers. In the Colorado River basins, they were high in 40% of the primary aquifers, on an areal basis; the percentage of area with high trace elements in all of the Desert Region primary aquifers ranged from 15 to 54% (Milby Dawson and Belitz, 2012). The trace elements with the highest percentages in the Colorado River basins were fluoride (high concentrations in 20%), strontium (10%), and boron (10%). Fluoride and strontium were detected at high concentrations in most of the primary aquifers in the Desert Region (five of six and four of six, respectively). Boron was detected at high concentrations in all of the primary aquifers in the Desert Region. Dawson, B.J.M., and Belitz, Kenneth, 2012, Groundwater quality in the Colorado River Basins, California: U.S. Geological Survey Fact Sheet 2012–3034, 4 p.